Does anyone here commute via bicycle, I would love to hear stories. I think durham, chapel hill, raleigh have potential for cycling commuters. I have a new goal of using public transportation plus bicycle more often. I live in RTP and go to school at UNC. I live close to the RTP Park drive main station so plan on taking the tta when school starts back up in fall. I do. I live near the Western Blvd K-Mart, and commute to the Dorothea Dix area. It's about a 4 mile ride along Western Blvd. The bicycle path along Western is a poorly designed facility (designed with the idea that bicycles can stop and start on a dime with no extra effort) so I end up riding with traffic half the time, but the eastern half of my commute is on the Rocky Branch Greenway, which is generally satisfactory. I also spend a great deal of time biking around (grocery shopping, and excercise) and have found that driving on the street and forcing automobiles to treat you like another vehicle is the safest bet in most locations in the triangle. Drivers in the triangle are clueless and dangerous when dealing with bicycles who timidly ride on sidewalks or in the shoulder, but they get the point pretty quickly when you take up the middle of the lane in a narrow spot. I agree with you, i ride my bike (for recreational purposes) in chatham county back highways. But use to live in raleigh and found it fairly enjoyable. 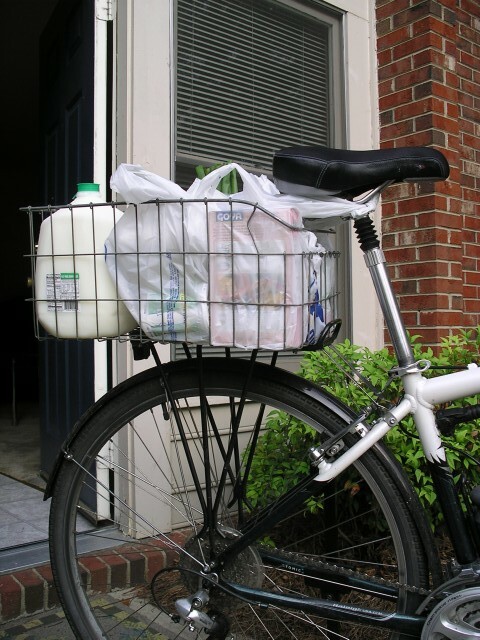 What kind of bike do you use and how do you carry grocercies on your bike? I would definitely be cool with riding a bike on some of the streets ITB, but forget it on the major arteries and most anything outside the beltline (except neighborhood streets)--I'll take my chances with a moped or just walking on the sidewalk. inside the beltline is great for cycling. I think downtown durham would be good for cycling too. I'm thinking of renting down there when my lease ends next may. 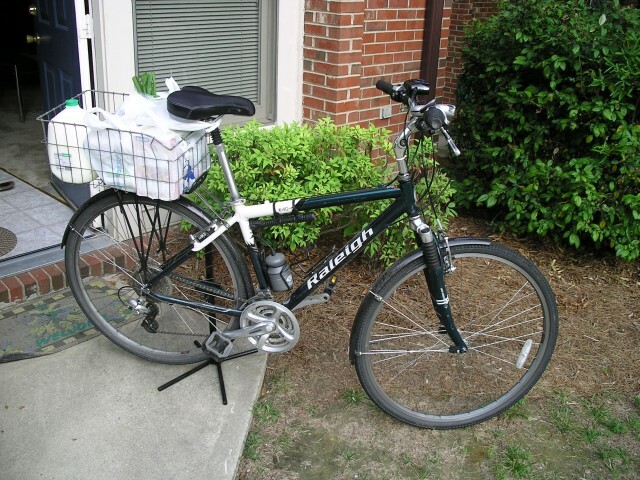 I have a Raleigh brand (ha ha) hybrid bicycle that I got from Cycle Logic on Hillsborough. Nothing too fancy, but that's best for a commuter because I don't mind if it gets banged up a bit. Since I bought it, I installed a rechargeable lighting system for riding at night, and fenders over the wheels to prevent myself from getting splashed when I go through a puddle or ride in the rain. I have a wire crate from an old chest-style freezer strapped to a luggage shelf on the back of my bike. Plenty of space to fit groceries for a week. Some people would say it looks stupid; I respond that my bicycle is not a toy and I'm not riding it to look "cool", I'm riding it as a practical, daily means of transportation. In Raleigh, hicks sometimes jeer at me from the cabs of their pick-em-up trucks. You learn to ignore it. In Carrboro I don't stand out at all. I'll take a picture once I'm back at home and have access to my digital camera. yeah, a picture would be good. I have a triathlon bike that I ride but try to keep that for training...and i have an old mountain bike. I would like to get a hybrid for commuting. I'm interested in seeing your crate contraption. I've noticed more bicycles out there on the street lately than ever before. I think it is a great form of transportation for people that don't have to commute a long distance--and it's healthy too (as long as you don't get run over). A friend of mine rides his bikes exclusively. He's a very friendly person but is certainly one of the most unique people you will ever encounter. He has been a bike enthusiast for a long time. He has a mountain bike and a recumbent. Often you can see him on the recumbent pedaling around Cary. He has a dream of one day sup'ing up his recumbant and going 100 MPH, or something crazy like that. I've ridden his recumbent a number of times and it is quite an experience--a real workout on your legs since you can't put any body weight into the strokes. It is comfortable though--the seat supports your tailbone and back nicely. Over the years Cary has added more bike lanes to their streets, and he really likes them--wishes more streets had them, especially some of the major routes. I think they are a great idea. a lot of people are starting to ride their bikes in rtp. Most of the new roads i've seen have bike lanes which is great. I would like to see more trails like ATT in durham and more interconnecting greenways like the shelly lake area in raleigh. I'm a big fan of bike lanes, too, if done properly. They're on the street so you're in the motorists' field of vision, but you're out of their way and they can pass you safely and easily. They should be at least 4 feet wide, and if they're on a road with on-street parking there should be at least a 5 foot buffer so that bicycles can safely clear the "door zone"
I'm not such a big fan of off-street bicycle paths (like the one along Western Blvd west of NCSU to Jones Franklin Rd). It switches sides twice, and amounts to nothing more than a wide, asphalt sidewalk. Curb cut + bicycle = dangerous. Greenways are fine, since street crossings are few and far between, and the ones that are there are generally well-signed. NICE BIKE. I'm impressed. Is that a hybrid and how much did you drop for it. I'm looking to buy one for commuting. And where did you buy your stuff to keep your crate stable? ^ No, I think it's a mountain bike outfitted with hybrid tires, like mine. I'm looking to buy up to a street bike eventually, rather than commute in my (oh jeez - I forgot what kind of bike I have!) mountain bike. They are so much lighter & you can get around much quicker. But the nice thing about having mountain bikes is in cities such as Atlanta where the sidewalks aren't mantained too good - you can jump over curbs, potholes, & other 'urban' obstacles. But nice mileage! In the past I've bummed off of my wife for a ride since I sold my car 4 years ago. So I will take MARTA (transit) if I'm not biking, but otherwise I'm not completely car free since we drive around on the weekend. But I get my wife out on a bike or walk every other weekend though. Good for you selling your car. My goal is to be virtually car free. This actually is a hybrid - the suspension has a shorter travel and is firmer than that of a mountain bike. It also has a greater emphasis on comfort than any mountain bike or road bike, and even than some hybrids, due to a more upright seating position. It does make it take more energy to go faster. I paid $320 for the bike, and about $40 at REI for the fenders and $70 for the headlights. The speedometer/odometer was a gift. I also have an older, AA battery-powered headlight installed as a backup. It doesn't illuminate the road well, but at least I'm visible in case my rechargeable light runs out of juice. I keep the crate stable and attached to my luggage rack with hose clamps that I bought at K-Mart. Pack of 4 for $1.19. I used two packs. You have to tighten them occasionally, but that's only about every three months. The fastest I've ever gone on this bike is 43mph, heading down Greensboro St from Chapel Hill towards the 54 bypass. Downhill, of course. I looked at the raleigh (bike) website and they are really reasonable. And I'm sure I can find one cheaper at a dealer as well. I'll have to search around for the luggage racks. I too ride a hybrid "Raleigh" brand bike from Cycle Logic. 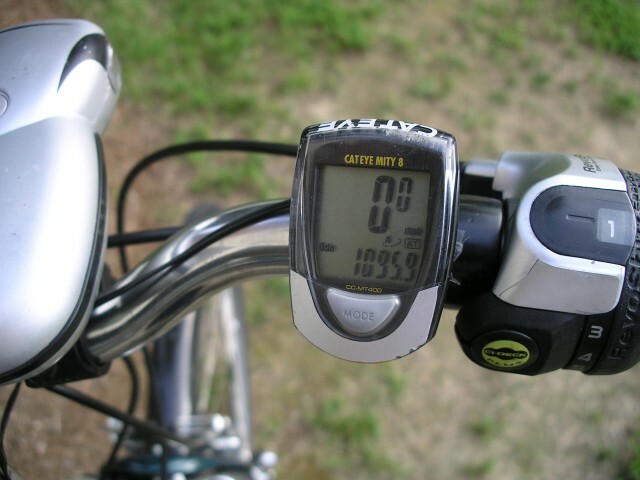 In fact, I put no more than twenty miles per week on my car by biking everywhere. I live and work in Downtown Raleigh, so I echo the easy biking sentiment mentioned earlier. something to look out for in case you're thinking about getting a hybrid. Obviously there's a spectrum of bikes, from an emphasis on performance to an emphasis on comfort. Riding position, tire width, handlebar height, and seat design are what I've found to be the most important. With a more upright riding position, you lose efficiency but you don't have to bend your back or neck as much. All hybrid bikes will have 700mm rims; tires will vary from around 30mm to 40mm. The thinner the tire, the faster your bike gets, but the comfort level suffers. Most hybrid bikes have a seat designed with comfort in mind, but you a narrower, firmer one can allow you to lean forwards further, decreasing drag and improving pedaling efficiency. I went pretty far towards the side of "comfort" with this bike, but that doesn't mean I can't take it out for a 40 mile ride every once in a while. Also, I really don't deserve the praise regarding 'selling my car', b/c again - my wife owns a car. So I don't really suffer much - & it's not really hard (unless you have kids) for a single couple to just have one car. Well - it depends on where the spouse works of course... But at least having one car limits our costs & driving as well. well, most couples have two cars so its still a step in the right direction. so, i'm thinking to save money, i'll just spruce up my mountain bike and use that for commuting rather than my expensive triathlon bike. I wanted to share the link below, but I thought this forum might have more to say about bicycling in general than just a discussion about the recently-opened Durham Bike Co-op. We often talk about the walkability of our urban areas. How bike-able are the Triangle's cities? I don't believe I've ever seen Raleigh, Durham, or Chapel-Hill appear on any of the popular "Best Cities for Biking" lists, though I wouldn't be surprised to find the entire region appear there soon. The climate here is fantastic for riding bikes, given the miniscule annual snowfall and mild temperatures year-round (save for June-August, when night riding is preferable). Plus there's a pretty great trail network around the area. Anyone ride a bike to work? If you like to do most of your biking on greenways, this area is good. However most of the Triangle still has a ways to go as far as bike lanes, etc. I kinda like what they did on a good portion of Western Blvd...it's a "bike lane" but it looks more like a sidewalk, up off the street to be safer. I've been thinking about starting a topic like this too. I just bought a mtn bike late last year, so I'm getting more into it lately, especially as a means of transportation, and not just for recreation. I've made three trips up to North Hills from DT Ral a few trips around DT and East Raleigh, and over to NCSU/Centennial Campus... headed to NHills, as long as I stay on St Marys/Lassiter Mill (which is actually a bike route), it's fine, and when I head west, I try to keep off Hillsborough as much as I can. In general ITB is probably the best place in Raleigh to bike, as there are a few places you can pickup greenway trails, the streets are well connected, and are generally not too wide or congested. In the Triangle, Carrboro leads the way in bike-friendly roads. I commute one way by bike on an irregular basis (once or twice a week when the weather is nice.) I ride the bus the other way. As luck would have it, I rode the bus to work this morning, and plan on biking home this evening. I live in Chapel Hill and work in RTP. The ride is about 14 miles one-way, mostly on back roads. For the mile or so that I ride along highway 54, there is a bike path, which helps a lot. Chapel Hill (after Carrboro) may be the most bike-friendly town in the state. People in CH just generally seem to understand how to ride around cyclists. Cary, on the other hand, which bills itself as a "bicycle friendly town", has its lanes full of speed demons and roadhogs who can't be bothered to delay themselves for 15 seconds while they wait for an appropriate opportunity to pass. Something quite fun I did a week or two ago, was I bought a ticket on the Piedmont from Durham to Burlington. Stuck my bike on the train (they have bike racks), got off in Burlington, and biked back home to Chapel Hill. Highway 54 between Burlington and Carrboro is an excellent road for biking. Problem is, though, the TTA bus does not arrive at the Durham Amtrak station early enough on Saturday morning to catch the train, so you're stuck either biking or driving to the station.